Pedal Exerciser Includes Comfortable Pedal Straps (not adjustable). Adjustable tension control for you to choose the resistance level based on your need. Stable and secure, sturdy tubular steel construction, thick main frame, made of heavy-duty gauge steel. 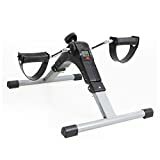 Compact and lightweight, easy for moving or storage, exercise at home, backyard, pool side, beach, or in office, extremely convenient for outdoor exercise.